Following a rough start to a hectic week of baseball action, the Albion Cornerstone Legion Juniors rallied to finish on a strong note this past weekend. The local Juniors dropped two lopsided decisions in Albion Tuesday and Thursday before bouncing back with consecutive victories over O’Neill and Shelton-Gibbon Friday and Sunday. The victories boosted Albion’s record to 6-7, as the Cornerstone Juniors head into the final week of their June schedule, then the final month of the summer season. What began in promising fashion went downhill, as the Albion Cornerstone Seniors dropped three straight games to close out a busy week of American Legion baseball action. 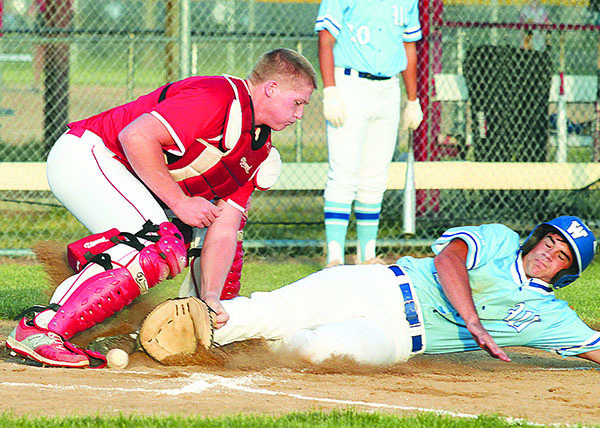 After thumping Neligh Tuesday, June 20, Cornerstone was able to muster only six total runs in consecutive losses to Wayne, O’Neill and Shelton/Gibbon – four of those coming in Sunday’s contest alone. Albion Cornerstone dropped to 7-9 on the season going into the final week of June and games against PWG, Sutton and Bennington.